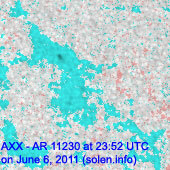 Last major update issued on June 7, 2011 at 04:55 UTC. Last minor update posted at 17:45 UTC. 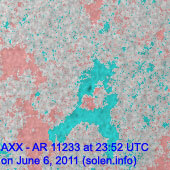 The geomagnetic field was quiet to unsettled on June 6. 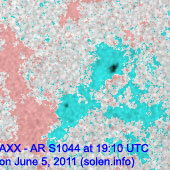 Solar wind speed ranged between 444 and 496 km/s. 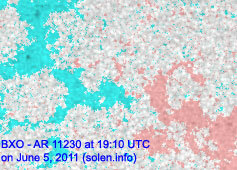 Solar flux measured at 20h UTC on 2.8 GHz was 100.2 (increasing 2.7 over the last solar rotation). 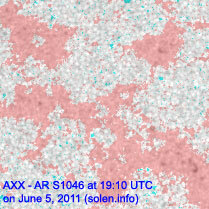 The planetary A index was 7 (STAR Ap - based on the mean of three hour interval ap indices: 7.3). 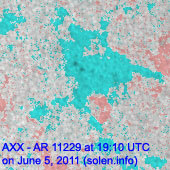 Three hour interval K indices: 32212122 (planetary), 22312211 (Boulder). 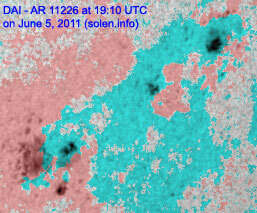 Region 11226 decayed further and lost all trailing polarity penumbra. 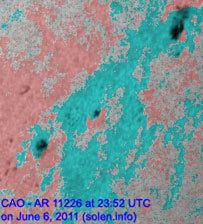 Flares: C1.2 at 01:35 and C1.0 at 09:50 UTC. Region11228 was quiet and stable. 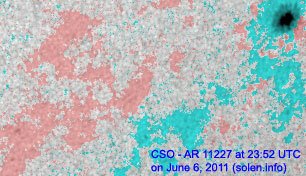 Region 11233 decayed slowly and could soon become spotless. 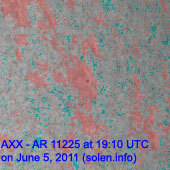 While none of the regions on the visible disk are very interesting, what was region 11222 appears to have developed into a spectacular region on the backside. 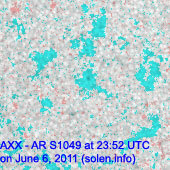 On June 4 it produced one of the brightest CMEs of cycle 24 and STEREO imagery indicates frequent flaring and a very hot region. 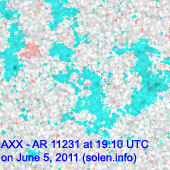 12222 will not return into view until June 13. 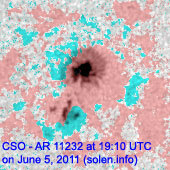 Minor update added at 07:35 UTC on June 7: Region 11226 produced a minor M2.5 proton flare at 06:41 UTC. 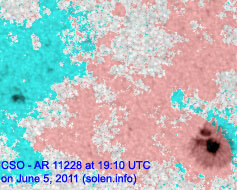 The event was likely associated with a large and fast CME judging by the earliest images after the event. 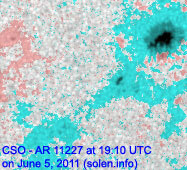 Although 11226 is approaching the southwest limb, the CME could be partially Earth directed and reach us on June 9. 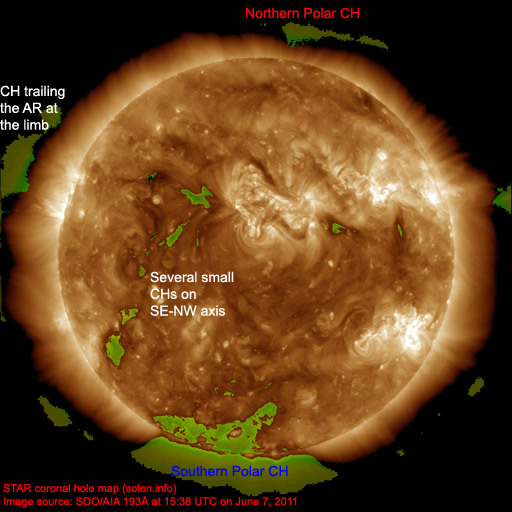 A more detailed CME forecast will be posted later today if the CME is likely to cause a major disturbance. Minor update added at 15:20 UTC: The full halo CME observed this morning will likely reach Earth sometime between noon on June 9 and the afternoon of June 10. Unsettled to major storm conditions are possible for 12-24 hours after the disturbance begins. Both the above 10 and 50 MeV proton fluxes reached event threshold before noon today. 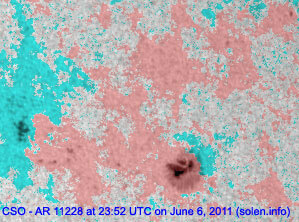 The CME associated with M2.5 event was spectacular in SDO images. 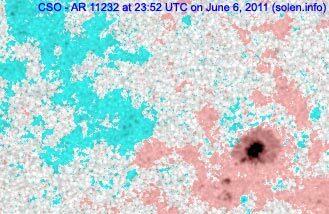 Some of the dark ejecta at the outer edges of the CME failed to escape and fell back over a large area of the solar disk. I recommend watching this movie if you have a high bandwith connection. 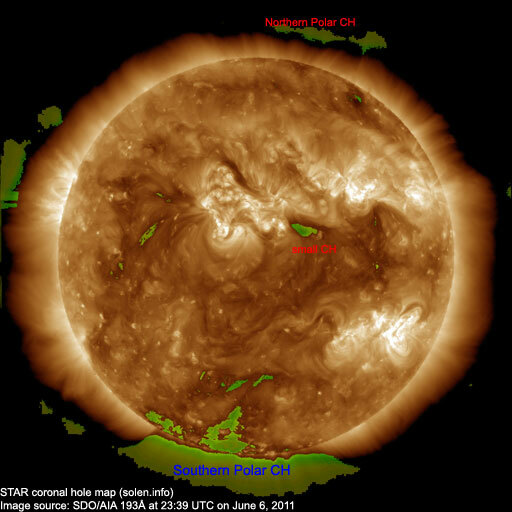 Minor update posted at 16:25 UTC: The newest coronal hole map and high resolution active region map. Notice in the latter image that the M2.5 event today blew away nearly all spots in region 11226 with the slightly complex polarity situation near the main penumbra disappearing. Minor update posted at 17:45 UTC: ACE solar wind parameters indicate that a high speed stream, likely from CH453, arrived at approximately 16h UTC and could cause unsettled to active geomagnetic conditions. June 4-6: No obviously earth directed CMEs were observed. 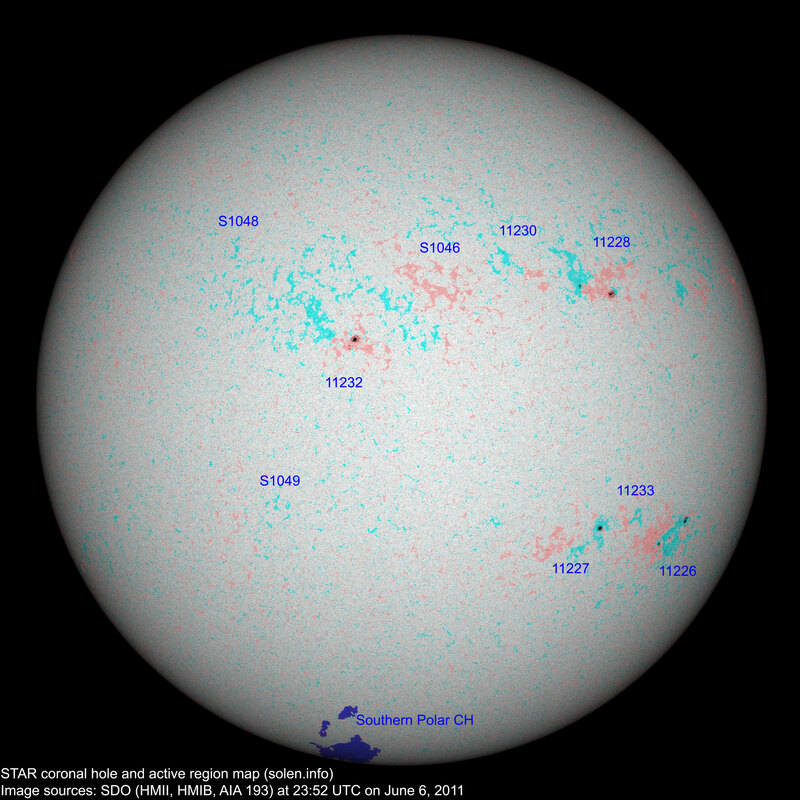 The geomagnetic field is expected to be mostly quiet on June 7-9. 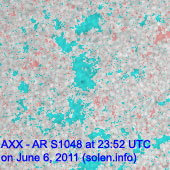 On June 7 effects from CH453 could arrive and cause some unsettled intervals.